The game has changed… The ALL NEW Mercury 15hp Pro Kicker FourStroke battery-free EFI changes the way you will think about portable outboards. Lighter, more powerful, more efficient, more durable, more intuitive… unlike any other portable fourstroke. • Our lightest 15hp FourStroke ever • Best in class performance • Battery Free EFI for fast, reliable starting • New exclusive multi-functional tiller handle, adjustable for left or right handed operation Mercury Pro Kicker FourStrokes feature heavy duty transom brackets for durability and power tilt as standard. Larger command thrust gear cases allow for a wider choice of propellers and more thrust from a gearcase sitting lower in the water. Standard on tiller models, centering straps help support the engine when used as an auxiliary or when trailering. 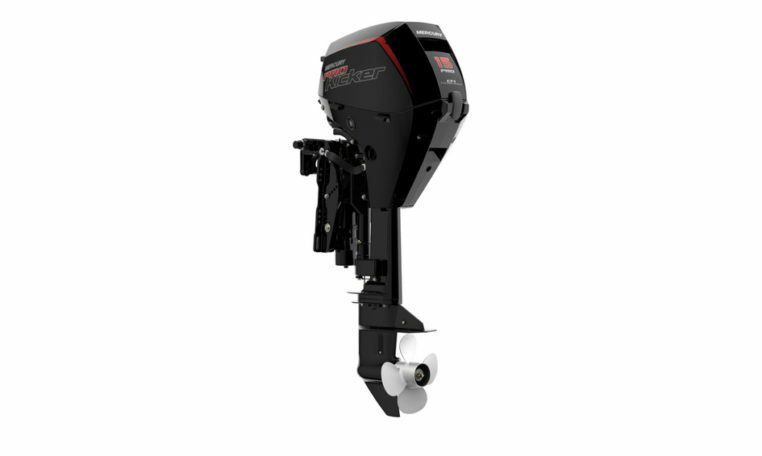 All recreational Mercury outboard models from the 2.5 – 350hp range now come with 3+3= 6 years of warranty coverage. World class engines, world class support, that’s what you get when you buy a Mercury. Please note: Price is for base 15 ELPT EFI ProKicker engine only, for rigging and other combinations please contact us.